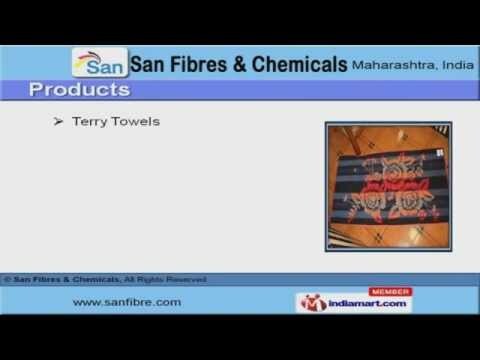 Welcome to San Fibres & ChemicalsManufacturer & Exporter of Apparels & Home Furnishing ItemsThe company was established in the year 1991, at Mumbai. Our Good financial position& TQM help us to cater Indian Subcontinent. Alpha Logicasa & W Group Trading Ltd. are some of our prestigious clients and we arebacked by Latest & exclusive designs. We offer a wide assortment of Embroidery, Plain & Jacquard Towels. Our Printed Towels, Bathrobes & Bathmats are best in the industry amongst others. Beach Wears, Fancy Bags & Jute Bags offered by us are available at industry leadingprices. Our Rib Mats, Kitchen Wear & Accessories are in huge demand across the globalmarkets. We also provide Ladies Tops, Kids Nightwearâs that are a class apart. Along with that we offer Cotton Kimonos, Table Cloths & Napkin Sets that are nothingbut the best solution for all your needs.